Ireland may have added a little gloss to their autumn campaign with victory over Argentina but the paint will be peeling by the time they re-group for the Six Nations. The score line may suggest their victory over the Pumas was emphatic but it cannot hide their failures to dominate a one-dimensional opponents. They did outscore their rivals two tries to none and fly-half Jonathan Sexton was in fine form from the kicking tee but they failed to find the tempo and intensity that offered so much hope in defeat to New Zealand last time out. It was a frustratingly flat performance that offered little to another disappointingly low crowd that had braved freezing temperatures in the Irish capital. Gone was the zip and the intensity that had the crowd on its feet when the All Blacks were in town to be replaced by a workmanlike display that was rewarded with victory but failed to set the world alight. Ireland's performance was punctuated with the odd glimpse of magic - most notably centre Gordon D'Arcy's excellent chip and chase for his side's second try - but too often they were happy to kick possession away rather than take on a Pumas side ripe for the taking. They defended stoutly to withstand an early raid from the visitors and there was a fair amount of attacking flair but at the same time errors and turnovers undid much of their good work. And the Pumas were allowed to battle their way back into the game all too easily. D'Arcy's performance in particular was worthy of note but some how he was edged out for the man of the match honour by Mr Consistency - No.8 Jamie Heaslip. Sexton's near-faultless display from the kicking tee underlined his worth to this side but Ireland will need him to be a more dynamic presence with ball in hand if they are to trouble some big names down the line. Ronan O'Gara is a more than able deputy on both counts and may yet get some time in the No.10 shirt. 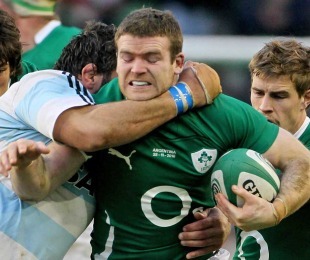 Ireland claimed two victories out of four games this month which was the minimum requirement. But five defeats in their last seven games still does not make pleasant reading. Declan Kidney's side may not be going backwards but they are not making the progress in terms of development that is required with a World Cup looming. As a result next year's Six Nations takes on added importance but with his charges not due to come together until the week before the Championship the pressure is on Kidney to work some magic. You had to feel for Argentina with referee Mark Lawrence seemingly intent on robbing them of their one major weapon - the scrum - with some baffling decisions most notably in the opening minutes of the game. The dominant Pumas pack looked set to be rewarded for an impressive opening sortie with a penalty try but in a pivotal call Lawrence handed the ball and with it the game to the hosts. Stripped of their potency they flailed around in attack and showed painfully little ambition with their cause not helped by the mis-firing boot of fly-half Felipe Contepomi. The Pumas' back division appeared confused at times and they desperately need to find their cutting edge again if they are to shine on the World Cup stage again next year. And while their backs lack direction their ageing forward unit is seemingly coming to the end of their shelf life. The front row warriors Rodrigo Roncero, Mario Ledesma and Martin Scelzo will have set their sights on next year's showpiece but the miles on the clock are more evident than ever. To their credit, they raised their game after the break but despite all their industry they never looked like cracking the Irish defence. It was a shame that the final act in an otherwise entertaining autumn series was such a let-down but it should serve as a reminder to any side looking to compete with the Tri-Nations giants next year that there is plenty of work to be done - for Ireland that begins with a trip to Rome in February for their opening Six Nations fixture against Italy.